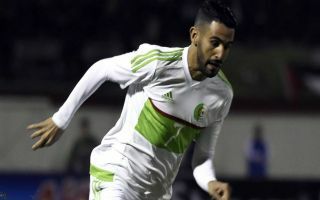 Manchester City attacker Riyad Mahrez scored twice during Algeria’s 4-1 win against Togo in an Africa Cup Of Nations qualifier on Sunday. The 27-year-old has been in electrifying form for the Premier League champions this season, showing his class on the right-wing following his £60 million from Leicester City during the summer transfer window – as Sky Sports reports. He managed to transfer that form to international level over the weekend, inspiring his country to a crucial away win after opening the scoring with an outrageous long-range volley. Mahrez was gifted the ball when the Togo goalkeeper came to deal with a through ball but misjudged his header and the City superstar took one touch to set himself before expertly lobbing the ball into the net. Riyad Mahrez scores 2 in 30min to put Algeria 3-0 up against Togo in AFCON qualifiers! Here is the opening goal! ? The Africa Cup Of Nations qualifiers are LITTY?